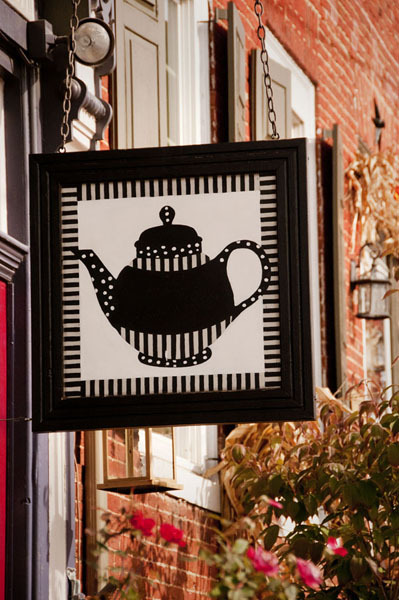 The fanciful black and white teapot block that hangs outside Tickle Your Fancy Gifts and Tea at 110 Lincoln Way West is a symbol for what visitors will find once they enter the shop. Painted by Charles Harr, the teapot is a simulation of an appliqué, mixing both stripes and polka dots in a playful manner. Owner Lyn Henry chose a teapot instead of a teacup because tea tastes better when shared with a friend. Let Mrs. Teabody put the kettle on when you visit Tickle Your Fancy.